A common problem that mobile users face today is the occasionally high data charges that often discourage them from remaining online while travelling in Europe. Thus, demand for Wi-Fi access in public areas has risen dramatically, a trend that is also stressed by European Commission�s program, WiFi4EU. Through this initiative, EU aims to offer free Wi-Fi connectivity to citizens and visitors in public spaces across Europe. The municipalities that will have the opportunity to participate in this program, will receive a voucher that covers the installment of Wi-Fi equipment in public spaces within the municipality that are not already equipped with a free Wi-Fi hotspot. Who can apply for the WiFi4EU program? Intracom Telecom offers a Virtualized Wi-Fi Services platform that manages centrally different networks independently of the Wi-Fi access point vendors. Intracom Telecom's solution unifies heterogeneous Wi-Fi Access Points, providing a centralized network management and unified services delivery engine. Moreover, Intracom Telecom has implemented an extensive Out-of-the-Box network services library (incl. DHCP, VoIP, Firewall, Web-Portal, Gateway, AAA Radius, NAT, DNS, Ad-Insertion, etc.) allowing Service Providers to readily offer new services in minimal time-to-market, while new 3rd party network service functions can effortlessly be integrated when needed. Finally, Quality of Service (QoS) can be applied based on different SSIDs (Class of Service CoS), or based to applications. Intracom Telecom's Wi-Fi Service Innovation Platform is ideal for municipalities and other similar cases as it is able to configure thousands of multi-vendor Wi-Fi Access Points from a single central point, powering a vast number of services. By using a point-and-click Graphical User Interface (GUI), the administrator can create different SSIDs providing separated and isolated set of services in each network. Finally, the municipality will also be able to provide and some innovative services at minimum time-to market with minimum capital and operational expenditures (CapEx and OpEx). WiBAS™-Connect, the most compact and lightweight microwave all-outdoor Terminal Station in the market, is designed to offer maximum convenience. The auto-polarization feature implements automated scanning of all polarizations / channel combinations, leading to fast and reliable installations. The polarization of the radio can be switched remotely (by the management software), eliminating the need for on-site interventions. With high capacity, advanced networking features, low power consumption and leading Point-to-MultiPoint radio technology, WiBAS™-Connect offers extremely-reliable operation. It enables state-of-the art IP connectivity in zero-footprint installations and at service locations requiring cost-effective and rapidly-deployed broadband access networks. Improved modem technology enables the highest channel bandwidth utilization and densest PtMP networks � up to 90 WiBAS™-Connect terminals � in the market. 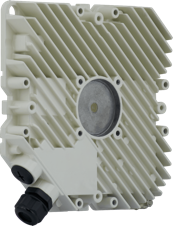 StreetNode™ is engineered to enable wireless backhaul network topologies in challenging locations and deliver best-in-class connectivity at street level. It offers higher practical usability over any other solution in the market, accelerating and facilitating public access deployment, as well as minimizing the operator�s investment and operational complexity. 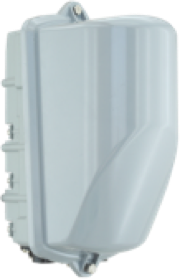 Its unique feature to operate as Point-to-MultiPoint terminal / hub or Point-to-Point unit, and the innovative auto-alignment mechanism of its built-in antenna, make StreetNode™ a comprehensive yet outstanding solution for wireless backhaul of broadband access traffic. Operation can be in a variety of licensed and license-free frequencies, whilst its elegant design, compact size and availability in a variety of finishes (colors) allow this radio to blend unobtrusively in the urban landscape. It can be installed on wall surfaces or lamp posts, thus reducing the associated site costs significantly. StreetNode™ offers �zero-touch� service provisioning with advanced SON features, enabling �plug-n-play� connection to the network in a few minutes.